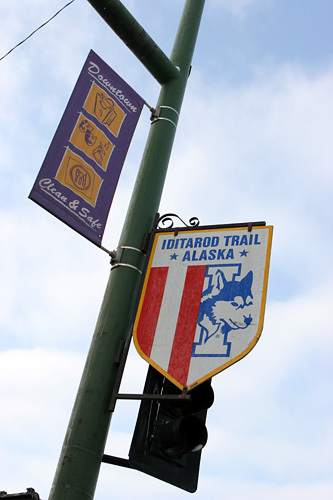 0094: The Iditarod race starts in Anchorage (ceremonial start, actual start is in Wasilla) and ends in Nome, some 1,100 miles away. 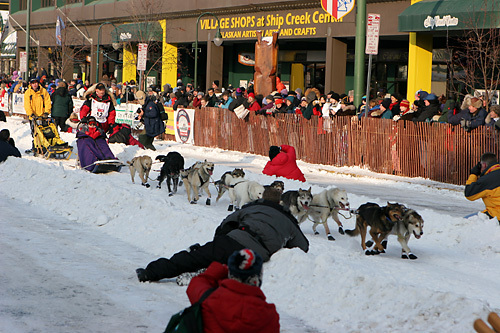 0107: Everybody is taking pictures as the dogs leave the starting line. 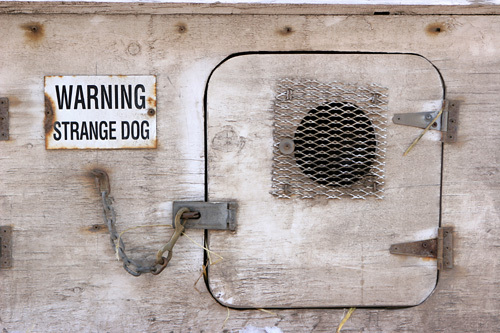 0116: One of the Iditarod race team's lead dogs. 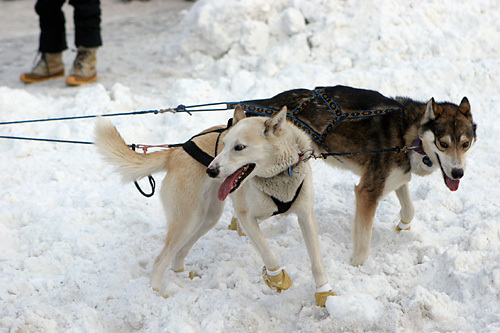 0126: One of the Iditarod race team - there were something like 46+ teams this year, the human racers are called mushers. 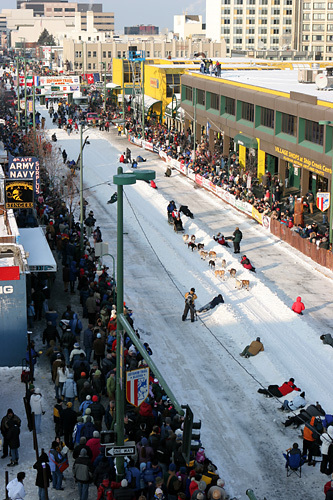 0141: This Iditarod race team has 12 dogs, the limit is 16 dogs. 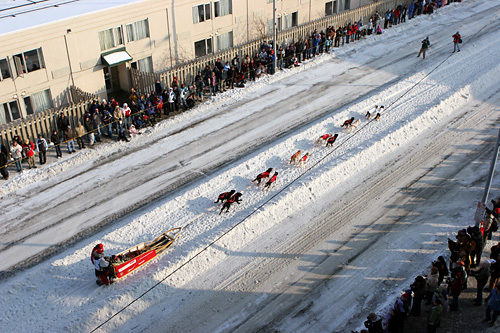 0154: The Iditarod race starts on 4th Ave in Anchorage. 0202: No captions needed here. 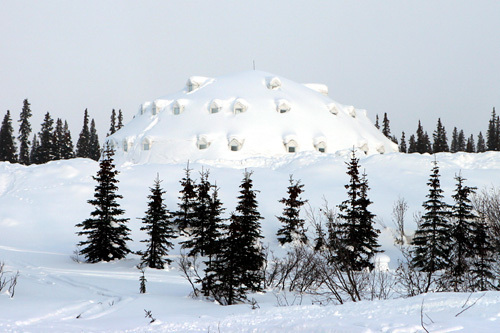 0290: The only Igloo en route from Anchorage to Fairbanks. Originally meant to have 48 pie-shaped rooms, with a 90-person dining room, it was never finished due to lack of funding. 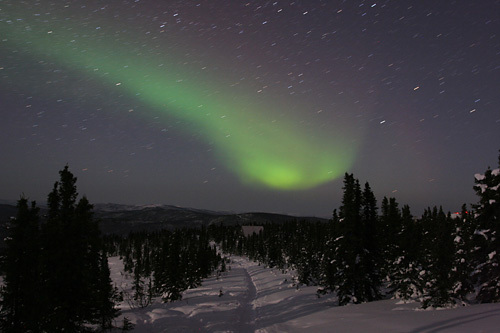 0377: The first sighting of the Aurora, as seen from Aurora Cabin, in Fairbanks. 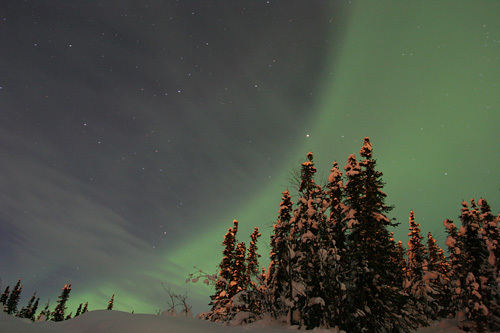 0403: Again, from Aurora Cabin in Fairbanks, we can see a bit of red along with the green. 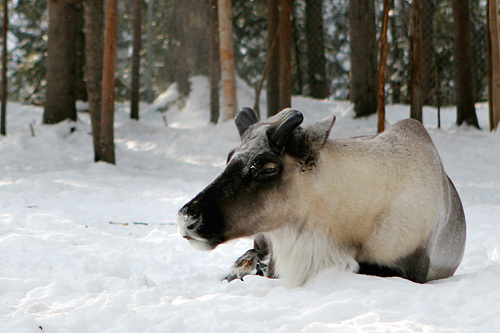 0468: A reindeer at the Santa Claus House in North Pole, Alaska. 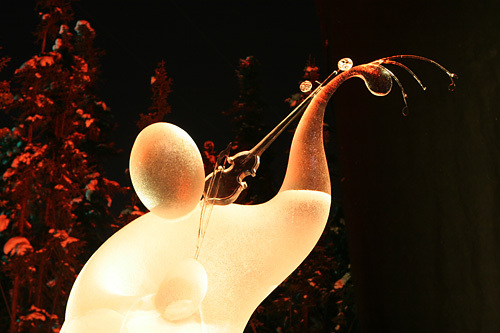 0744: The 2006 World Ice Art championships. 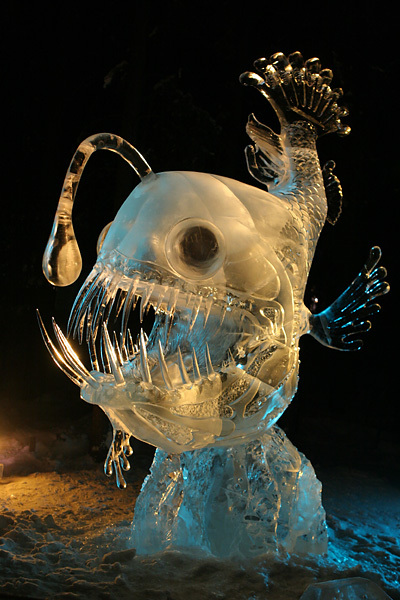 0657: One of the winners of the 2006 World Ice Art championships. This single-block scuplture is called the Fiddler. 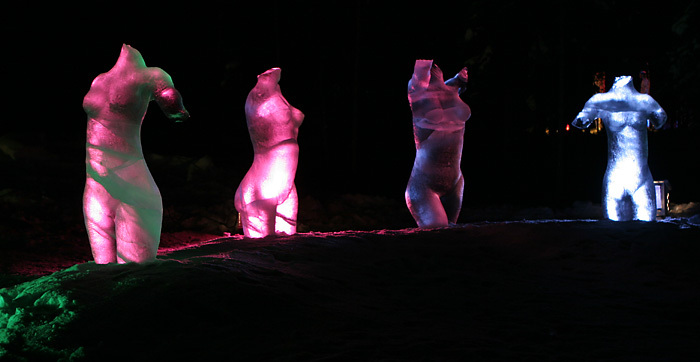 0660: Celebrating the human body in the 2006 World Ice Art championships. 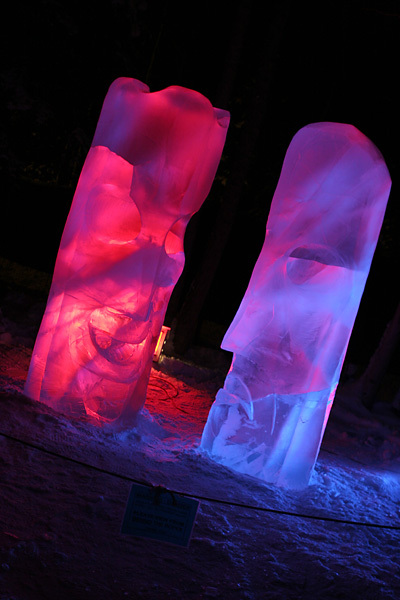 0689: Another single-block scuplture in the 2006 World Ice Art championships. 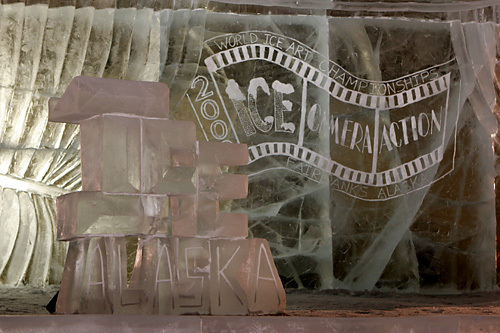 0695: The 2006 World Ice Art championships. These ice masks were about 7 foot high each. 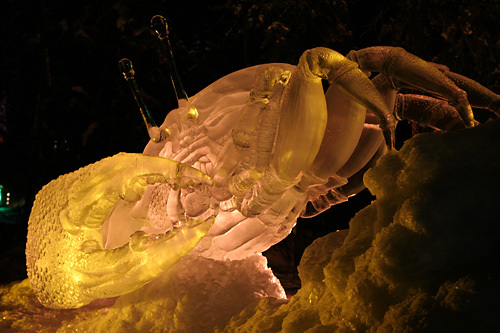 0711: The top winner of the 2006 World Ice Art championships -The crab. 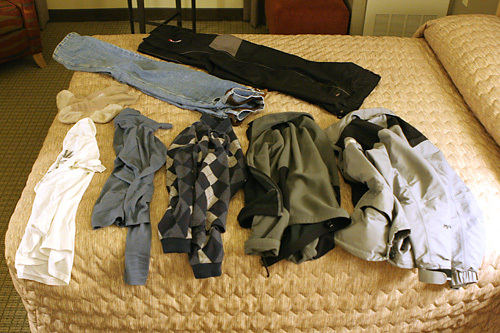 0755: This is how much I wore to keep warm. Not too bad actually: a tee-shirt, 2 long-sleeves, a fleece, and a wind-breaker. The most important was the ski pants outside of the jeans, thick wool/synthetic socks, and head/ear/neck protection. 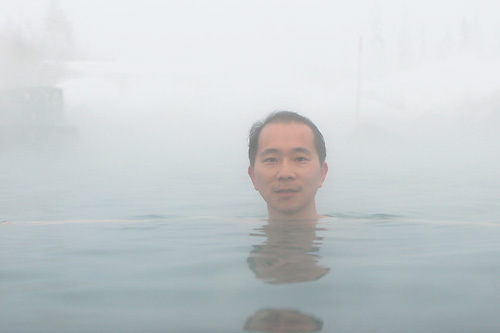 1031: Here I am in the Chena Hot Springs, about an hour's drive from Fairbanks. The water temperature was around 90-110 F.
1152: Aurora Borealis as seen on the grounds of Chena Hot Springs. The 4+ hrs we waited for the sky to clear was well worth it as we witnessed fantastic formations of lights. 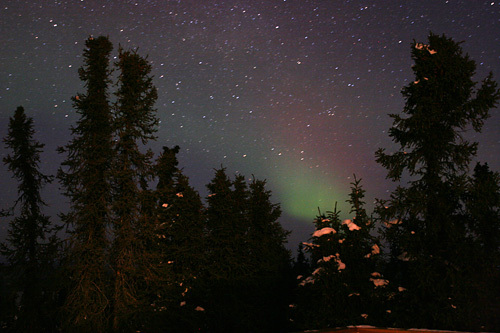 1170: Aurora Borealis as seen on the grounds of Chena Hot Springs. The ENTIRE foreground was filled with the Northern Lights, as if by a huge flash light from the solar system. 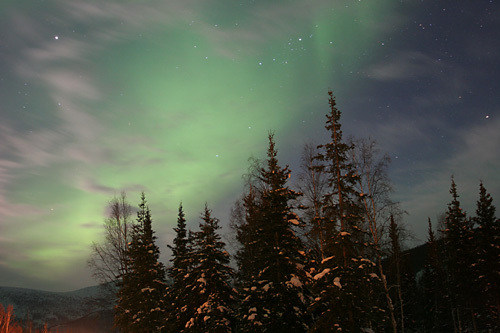 1184: Aurora Borealis as seen on the grounds of Chena Hot Springs. 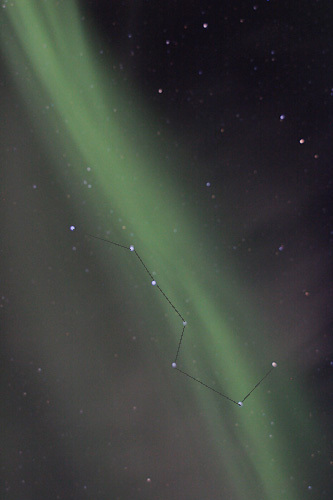 This was a most-fortunate shot of the lights streaking through the big dipper. 1191: Aurora Borealis as seen on the grounds of Chena Hot Springs. At times the lights were so bright, they lit up the sky and even a bit of the ground! 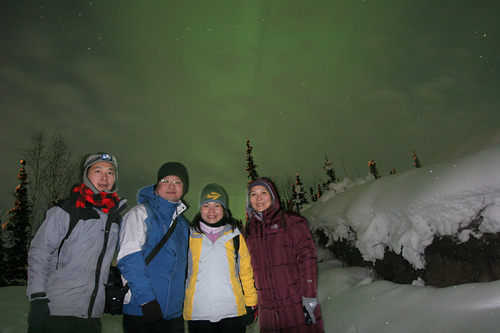 1210: The temperature had lowered to about 0 F when the Aurora appeared. 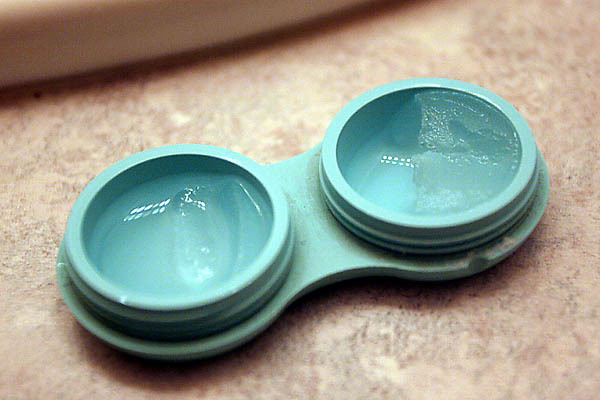 By the time I returned to the hotel room to take off my contacts, the lens solution had frozen over. The contact lens case was in my backpack. 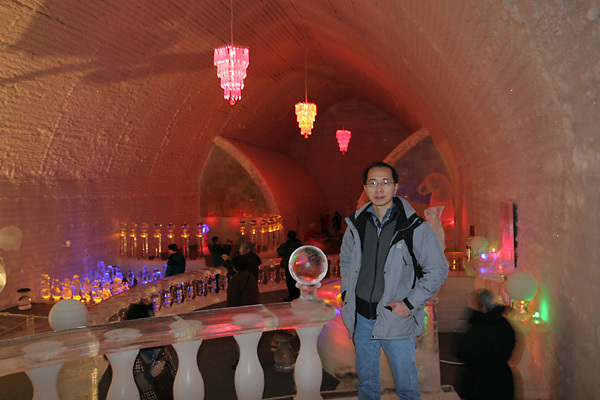 1318: This is the insides of the Aurora Ice Museum & Hotel, also on the grounds of Chena Hot Springs. Yes, people pay big money to sleep in here. There's a bar, fireplace, chapel, etc. 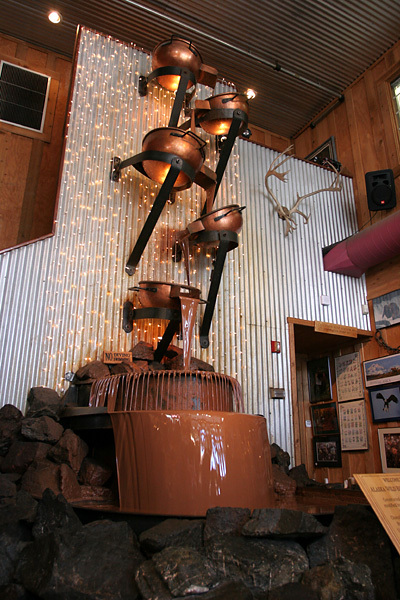 1496: This is the fountain of sweet chocolate in the Alaska Wild Berry Products factory, in Anchorage. 1567: This is a sunset shot along the Tony Knowles Coastal Trail which runs along west south-west edge of Anchorage's waterfront, along Cook Inlet and Knik Arm. You can hike, jog, bike, or.... ski on the trail. 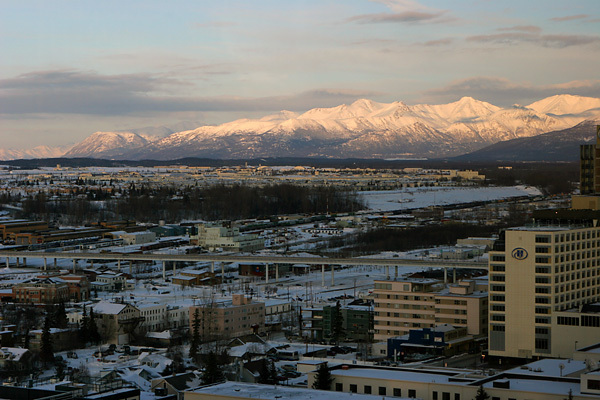 1606: This is a view of Anchorage downtown from atop the Captain Cook hotel, in their penthouse restaurant The Crow's Nest. The mountains in the back are the Chugach Mountains. 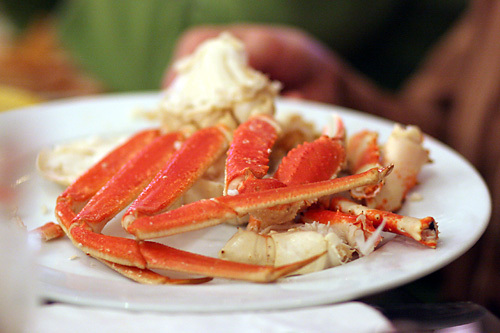 1632: Alaska Red King Crab dinner at Phyllis's cafe and Salmon Bake (436 D Street in Anchorage). 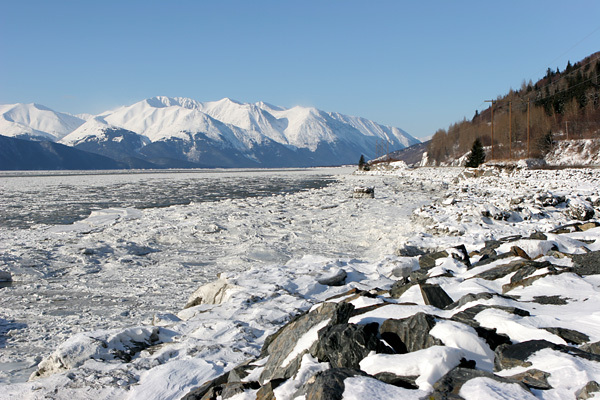 1772: A view of the Tordrillo Mountains from the Seward Highway, along the bay called Turnagain Arm. 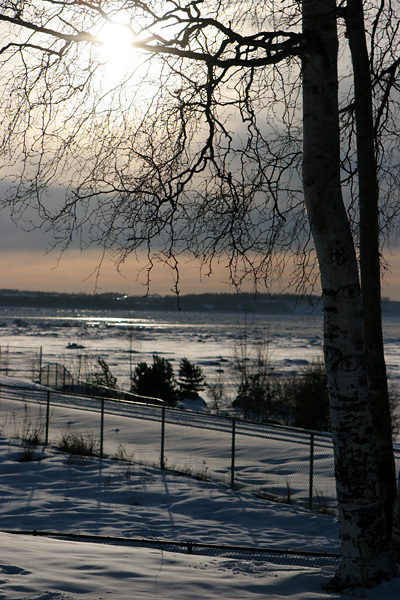 The tide level, at about 30-38' is second only to Bay of Fundy in Nova Scotia (Canada) which averages 40' (12 meters). 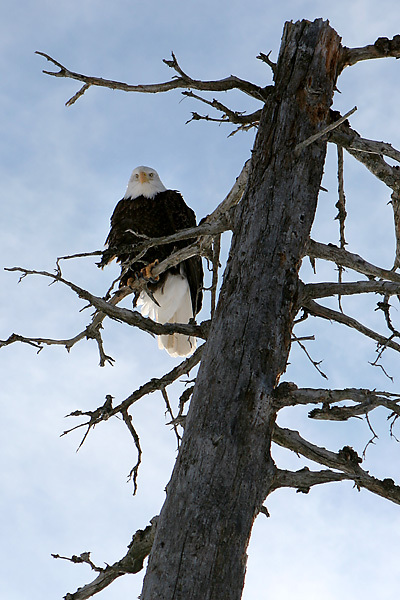 1817: A bald eagle in the Alaska Wildlife Conservation Center, located in Portage Glacier, off Seward Highway. 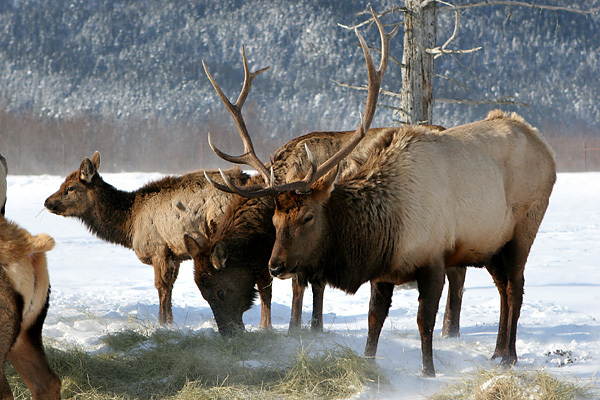 1849: A herd of Elks in the Alaska Wildlife Conservation Center, located in Portage Glacier, off Seward Highway. 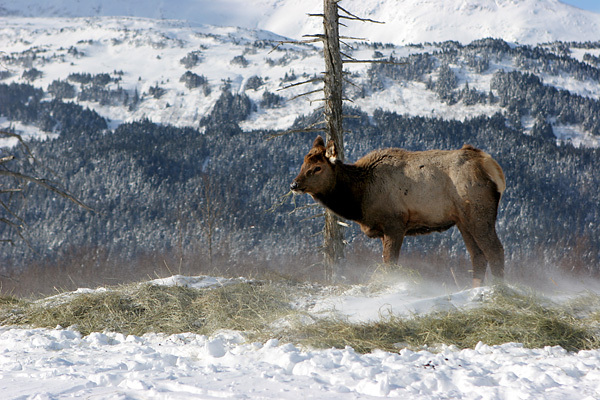 1851: An elk calf in the Alaska Wildlife Conservation Center, located in Portage Glacier, off Seward Highway. 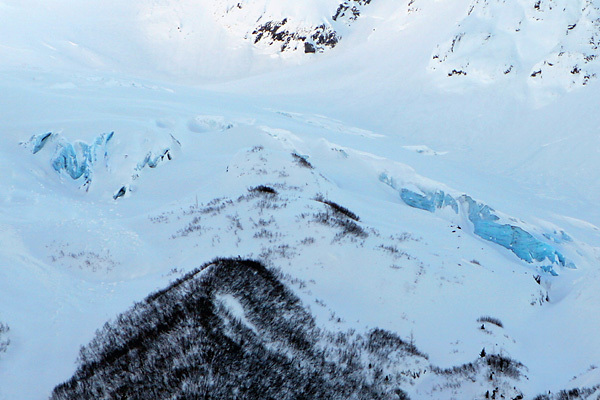 1996b: Mostly covered by snow, you can still see a bit of the ice of the Explorer Glacier in Portage Valley Recreation Area. 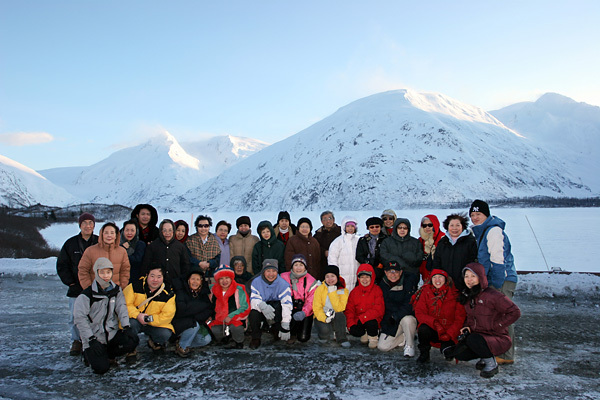 2016b: A group picture at Portage lake where the majestic Portage Glacier (not clearly visible because of the snow) recedes into. 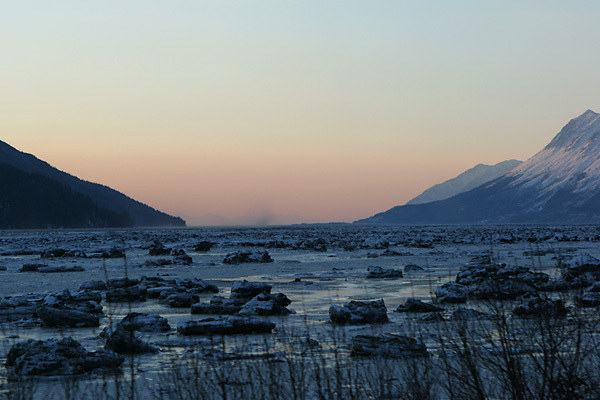 2034b: Sunset view of Turnagain Arm on the way back to Anchorage from Seward. The black/white blocks are ice blocks, some as big as a bus. They were broken up by the high/low tides which average more than 30' in this area. 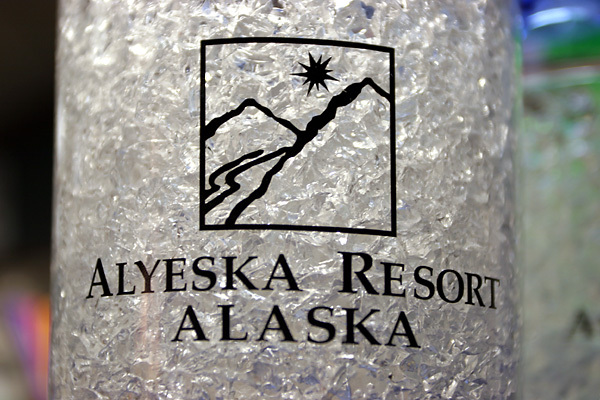 2055: We stopped by the Alyeska Prince Resort & Hotel in Girdwood on the way back to Anchorage from Seward. It has its own mountain for skiing! 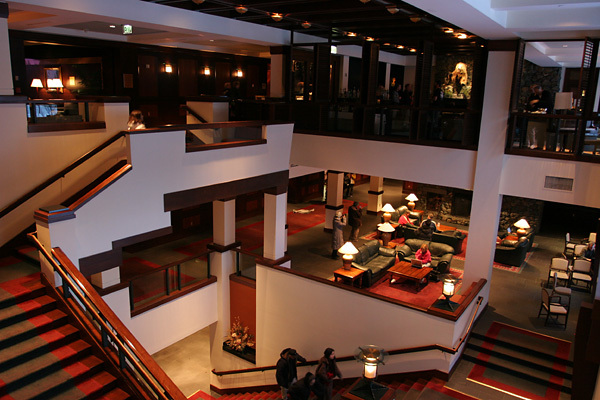 2053: Inside the Alyeska Prince Resort & Hotel in Girdwood - pure luxury. 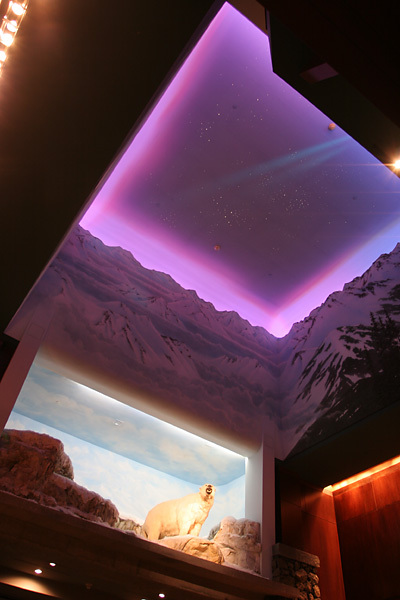 2057: Inside the Alyeska Prince Resort & Hotel in Girdwood - it has its own Northern Lights. © 1997 -2006 Signite.com. Contact for paulhuang.com.